Home / Diseases-conditions / Ayurveda / Shirodhara: Complete Ayurvedic detoxification all of us need! Shirodhara Ayurveda therapy stimulates the mind. The continuous pouring of the oil onto the forehead helps in inducing sound sleep. It also improves blood circulation and calms the mind. Shiro means head and Dhara means flow. 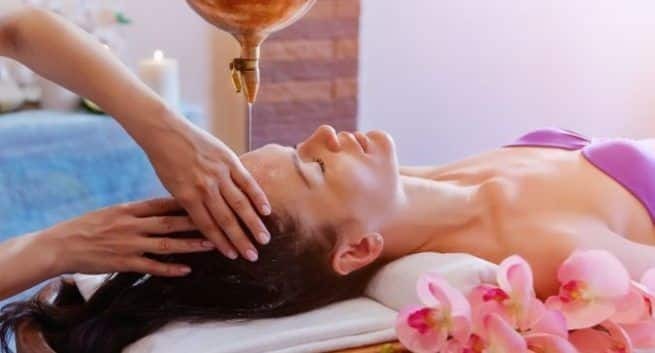 Shirodhara is a traditional Ayurveda therapy in which a steady stream of decoction or herb-infused oil is poured slowly onto the forehead or ‘ajna marma’, an area where nerves are highly concentrated. “One of the oldest, this Ayurvedic therapy has been practised in India for more than 5000 years. Shirodhara is a gentle and soothing massage that also helps in a better functioning of the nervous system,” explains Dr Priyanka Sampat, Ayurveda expert, Birla Ayurveda. The continuous flow of oil on the forehead, scalp and temples helps in curing hair fall related issues. As the oil is constantly poured, it nurtures the scalp and strengthens the roots of the hair follicles. The uninterrupted contact of the hair with the oil further reinforces and sustains the natural shine of the hair. One session of Shirodhara can lead to positive effects when it comes to controlling hair fall. The medicated oils used in Shirodhara help in the relaxation of mind and body. They help in removing harmful toxins, thereby cleansing the body. When the brain is under strain, cerebral circulation is compromised. As the oil is poured on the forehead, the nervous system is deeply stimulated. Shirodhara treats insomnia and sleep-related disorders to a great extent. Insomnia occurs due to stress and disturbance in the mind. With Shirodhara, the mind is at complete rest and peace, with no disruption from the outside world. This induces sleep and helps to ease the mind. In Ayurveda, the forehead is called the “third eye”. The pouring of oil on the “third eye” prompts positivity while taking the mind and body to a state of absolute tranquillity. A frequent flyer is often jet-lagged and weary due to the constant shift in timings and irregular sleep cycle. Shirodhara can play a significant role in resetting your daily pattern of sleeping. It also helps in reducing the fatigue experienced during travelling. It promotes deep relaxation and balances the energy levels. The oil poured on the forehead flows to all areas of the body. This increases the energy in the body, making you feel fitter and more energetic. Shirodhara is also used as a treatment for patients who are recovering from long-term ailments. With each Shirodhara treatment, the mind systematically gains more energy and more healing takes place. Shirodhara can help deal with conditions like cervical spondylitis, facial paralysis, severe cough, locked jaw and stammering of speech.